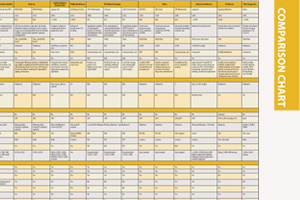 This article originally ran as an introduction to the Mobile C-arms comparison chart in the April 2018 issue. The chart can be viewed here. The market for mobile C-arm technology has been steady for the last several years, according to Jamie Dildy, BS, R.T. (R), clinical analyst for MD Buyline. The number of interventional procedures has been on the rise, and mobile C-arms provide a flexible, cost-effective option for image guidance during procedures across the hospital. While mobile C-arms do offer greater interdepartmental flexibility for interventional procedures, Dildy said that most hospitals still employ mobile and fixed systems simultaneously — with mobile C-arms most often found in surgical suites, while fixed systems live in the radiology department or the cardiac catheterization lab. With these roles well-established, while demand for mobile C-arms continues to be high, Dildy does not expect the technology will ever fully replace fixed interventional systems. Many of today’s newest room-based systems offer multiple configurations, including floor- or ceiling-mounted fixtures and bi-plane imaging (accomplished in the mobile space by G-arm systems). While most manufacturers of mobile C-arms still offer analog image intensifiers, all major vendors in the space have by now added flat panel digital detectors to their systems. The digital detectors, most commonly complementary metal-oxide-semiconductor (CMOS) technology, generate a higher quality image than with analog, and do so at a lower total radiation dose to the patient. Ziehm Imaging last year added a CMOS digital detector to its legacy system, the Ziehm Vision FD, giving it higher image resolution than conventional flat panel detectors, according to the company. The system employs the latest generation of Ziehm’s SmartDose concept to optimize safety for surgeons, staff and patients. SmartDose enhancements include an improved version of Ziehm’s ZAIP (Ziehm Adaptive Image Processing) algorithm and filters for sharp image detail, high-speed adaptive dose reduction through intelligent pulsed regulation, and dedicated anatomical programs for automatic adjustments in image quality based on the part of the anatomy being imaged. GE Healthcare stepped into the CMOS space in 2017 as well with the U.S. launch of the OEC Elite CFD, the newest edition to its OEC line of mobile C-arms. The OEC Elite CFD was first shown at the 2017 Radiological Society of North America (RSNA) annual meeting in November, after being U.S. Food and Drug Administration (FDA)-cleared in summer 2017. Maneuverability and workflow are key considerations for devices like mobile C-arms that are designed to be highly versatile and move from one room or procedure to the next. Several newer systems have introduced features with operator ease-of-use and workflow as central concepts. GE’s OEC Elite CFD system sports an ergonomic C-arm that easily pivots in the rainbow position for enhanced handling, with new locks to keep the system firmly in position. In acknowledgement of the busy nature of operating rooms or interventional labs and the number of people involved in procedures, the OEC Elite CFD also places a premium on easy viewing from anywhere in the room. The system features a new 4K monitor on the C-arm to enable extremely high-definition imaging, plus a 32-inch display mounted on an articulating arm with five ranges of motion. Siemens Healthineers incorporated numerous new features to improve workflow in its Cios family of mobile C-arms, which received FDA approval in 2016. The Cios Alpha is the heart of the line, and was reintroduced in the update with a new square flat panel detector, revised software for a larger preview image and a new one-touch metal correction function to compensate for metallic image artifacts. The Cios Fusion offers many of the same premium features of the Cios Alpha in the mid-range price segment. This includes a touchscreen remote that can be positioned at the operating table to control the C-arm from within the sterile work area. In the entry-level segment, the Cios Select sports a push-button interface for faster workflow. Philips’ newest mobile C-arm, the Veradius Unity, was designed primarily for interventional procedures and boasts several navigational aids to streamline activity, including the ClearGuide function that correlates directions in the image (up, down, left, right) with physical markers on the detector (3, 6, 9, 12). Operators can use a marker pen with the outline tool to create free format drawings on live fluoroscopy images, including vessel outlines and other anatomical references.